Among those who were his friends was King ran of Benwick, who was an exceedingly noble lord of high estate and great honor, and who was of a lineage so exalted that it is not likely that there was anyone in the world who was of a higher strain. Of King Ban and his misfortunes. army of knights and lords, and these sat down before the Castle of Trible with intent to take that strong fortress and destroy it. besides, for he was not only large of limb but so extraordinarily beautiful of face that I do not believe an angel from Paradise could have been more beautiful than he. He had been born with a singular birth-mark upon his shoulder, which birth-mark had the appearance as of a golden star enstamped upon the skin; wherefore, because of this, the Queen would say: "Launcelot, by reason of that star upon thy shoulder I believe that thou shalt be the star of our house and that thou shalt shine with such remarkable glory that all the world shall behold thy lustre and shall marvel thereat for all time to come." So the Queen took extraordinary delight in Launcelot and loved him to the very core of her heart--albeit she knew not, at the time she spake, how that prophecy of hers concerning the star was to fall so perfectly true. So by and by things came to such a pass that King Ban bethought him of King Arthur, and he said to himself: "I will go to my lord the King and beseech help and aid from him, for he will certainly give it me. Nor will I trust any messenger in this affair other than myself; for I myself will go to King Arthur and will speak to him with my own lips." King Ban bethinks him of King Arthur. beseech him to lend his powerful aid in this extremity of our misfortunes; nor will I trust any messenger in this affair but myself. Now, this castle is no place for thee, when I am away, therefore, when I go upon this business, I will take thee and Launcelot with me, and I will leave you both in safety at King Arthur's court with our other son, Sir Ector, until this war be ended and done." And to these Queen Helen lent her assent. enemies upon any extremity; for I believe I shall in a little while return with sufficient aid from King Arthur to compass the relief of this place." King Ban with Queen Helen and Launcelot escape from Trible. secret path, known only to a very few, that led down a steep declivity of rocks, with walls of rock upon either side that were very high indeed, and so they came out in safety beyond the army of King Claudas and into the forest of the valley below. And the forest lay very still and solemn and dark in the silence of the nighttime. "Methinks it must be the dawn that is breaking." "Lord," quoth Foliot, "that cannot very well be; for that light in the sky lieth in the south, whence we have come, and not in the east, where the sun should arise." King Ban beholdeth the burning of Trible. and, when he had come there, he cast his eyes in the direction of the light and he straightway beheld with a manner of terror that the light came from Trible; and then, with that terror still growing greater at his heart, he beheld that the town and the castle were all in one great flame of fire. Therewith a great passion of grief took hold upon him and shook him like to a leaf, and immediately after that he felt that something brake within him with a very sharp and bitter pain, and he wist that it was his heart that had broken. So being all alone there upon the hilltop, and in the perfect stillness of the night, he cried out, "My heart! My heart!" The death of King Ban. And therewith, the shadows of death coming upon him, he could not sit any longer upon his horse, but fell down upon the ground. And he knew very well that death was nigh him, so, having no cross to pray upon, he took two blades of grass and twisted them into that holy sign, and he kissed it and prayed unto it that God would forgive him his sins. So he died all alone upon that hilltop. The Lady Helen findeth the King. and by she said: "Dear Lord, thou art at this time in a happier case than I." And by and by she said to Foliot: "Go and bring his horse to this place, that we may bear him hence." "Lady," said Foliot, "it is not good for you to be left here alone." "Foliot," said the Queen, "thou dost not know how much alone I am; thy leaving me here cannot make me more alone." Therewith she fell to weeping with great passion. So Queen Helen and Foliot lifted the dead king to his horse and then the Queen said: "Come thou, Foliot, at thine own gait, and I will go ahead and seek my child, for I have yet Launcelot to be my joy. The Lady Helen bringeth her dead down from the Mountain. Haply he will be needing me at this moment." So the Queen made haste down the steep hill ahead of Foliot and by and by she came to the margin of that little lake where they had rested awhile since. Now as Queen Helen entered that meadow she beheld that a very wonderful lady was there, and this lady bare the child Launcelot in her arms. And the lady sang to Launcelot, and the young child looked up into her face and laughed and set his hand against her cheek. All this Queen Helen beheld; and she likewise beheld that the lady was of a very extraordinary appearance, being clad altogether in green that glistered and shone with a wonderful brightness. And she beheld that around the neck of the lady was a necklace of gold, inset with opal stones and emeralds; and she perceived that the lady's face was like ivory--very white and clear--and that her eyes, which were very bright, shone like jewels set into ivory. And she saw that the lady was very wonderfully beautiful, so that the beholder, looking upon her, felt a manner of fear--for that lady was Fay. [paragraph continues] "Lady, I pray you give me my child again!" 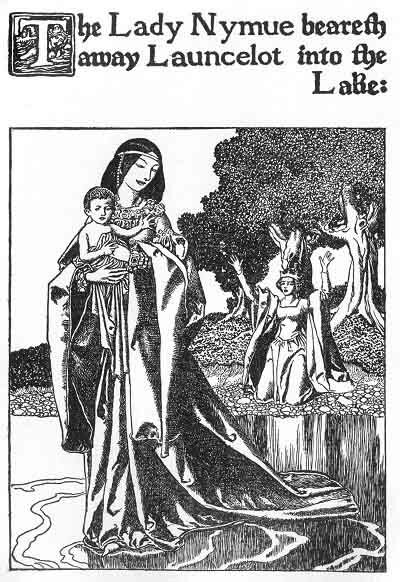 Upon this the Lady Of the Lake smiled very strangely and said: "Thou shalt have thy child again, lady, but not now; after a little thou shalt have him again." Then Queen Helen cried out with great agony of passion: "Lady, would you take my child from me? Give him to me again, for he is all I have left in the world. Lo, I have lost house and lands and husband, and all the other joys that life has me to give, wherefore, I beseech you, take not my child from me." To this the Lady of the Lake said: "Thou must endure thy sorrow a while longer; for it is so ordained that I must take thy child; for I take him only that I may give him to thee again, reared in such a wise that he shall make the glory of thy house to be the glory of the world. For he shall become the greatest knight in the world, and from his loins shall spring a greater still than he, so that the glory of the House of King Ban shall be spoken of as long as mankind shall last." But Queen Helen cried out all the more in a great despair: "What care I for all this? I care only that I shall have my little child again! Give him to me!" 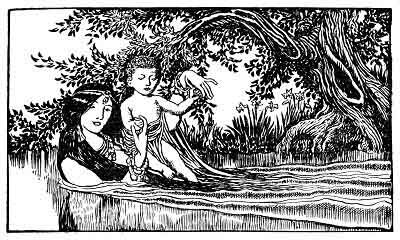 The Lady of the Lake taketh Launcelot into the Lake. Queen Helen's hand and said: "Touch me not, for I am not mortal, but Fay." And thereupon she and Launcelot vanished from before Queen Helen's eyes as the breath vanishes from the face of a mirror. What time he sat thus there came that way three nuns who dwelt in an abbey of nuns which was not a great distance away from that place. The Lady Helen taketh to a Nunnery. These made great pity over that sorrowful sight, and they took away from there the dead King and the woeful Queen, and the King they buried in holy ground, and the Queen they let live with them and she was thereafter known as the "Sister of Sorrows." How Launcelot dwelt in the lake. in the Book of King Arthur. For though he smiled a great deal, it was not often that he laughed and if he did laugh, it was never in scorn, but always in loving-kindness. one in all the world was more skilful in arms than Sir Pellias, and no one could so well teach Launcelot the duties of chivalry as he.